Printing is finished. Books in sheets now available! I’m happy to say that printing has come to an end for the latest book – The Intruder by Robert Traver / John Voelker. The last of the little wood engravings by Jim Westergard have been done and today the colophon was run through the press. The other four sections of the book have already been collated and folded, tomorrow this final section will be gathered. 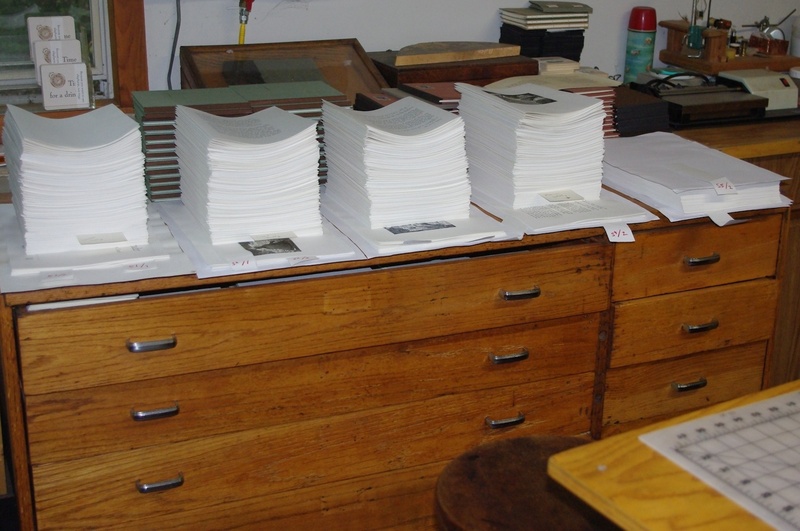 Punching the holes for the sewn binding will also begin and from here on out we’ll be focused on bindery operations. I will try to get books out to those of you who purchased in advance as soon as possible. For the specialty hand book binders 10 copies have been set aside in the numbered edition to be sold in sheets. Their are 7 still available on a first come first serve basis as these quickly sell out. Contact me directly for details as these are not on the website yet. Though I do not doubt that it does not work on your computer I am loathe to put such unsecure application on my own computer. I’ll check it out at the library if I get the opportunity. This is a WordPress template and it is hosted by them so I’m very surprised there would be any compatibility issues. Thanks for alerting me to the potential issue. Hi, Neat post. There is a problem together with your site in internet explorer, would test this? IE nonetheless is the market chief and a good component to other people will leave out your fantastic writing because of this problem.